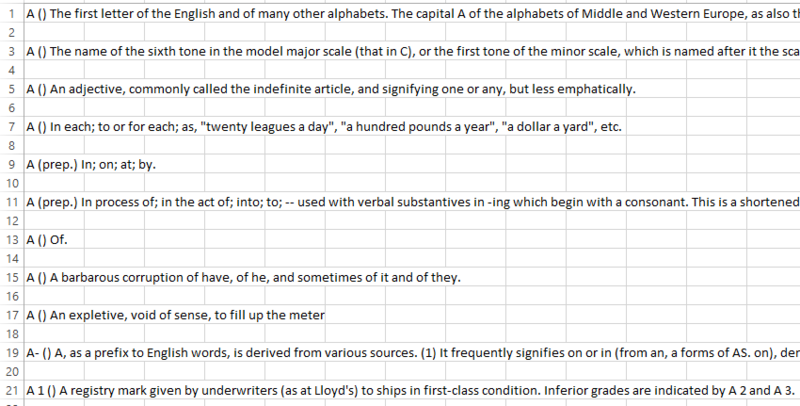 I was working on a project on an English Dictionary for Scilab where I made use of a dictionary in a csv file. I got the word meanings from OPTED(The Online Plain Text English Dictionary), which is based on “The Project Gutenberg Etext of Webster’s Unabridged Dictionary” which is in turn based on the 1913 US Webster’s Unabridged Dictionary (See Project Gutenburg), as a text file. I then converted the text files into csv. I am sharing those here if anyone needs them. Just don’t forget to thank me in the comments section below. I don’t know how to use it yet but I am sure it will be very usefull. Thank you. Well you can easily separate the words from the meanings by little programming.. I mean you could use a code that would find the first occurrence of this ‘)’ and then copy everything after it to a different file. I preferred to have the words and the meanings together cause I wanted to display the whole thing. g from ‘z’ then you would have to unnecessarily go through almost all the words in the file, thereby wasting a lot of time. I am Manoochehr Karimi , English Language Teacher, from Iran. I need the audio files of each English words in mp3. Would you mind helping me how to get them? Many thanks, indeed! Quite helpful. Thanks you very much u have solved my big problem……….. This is fantastic and is excellent work. Appreciate your feedback! 🙂 Glad you found it useful. thank you so much for the materials! Thank you so much mate! You really made my life easier! Cheers! How is this more practical than the original OPTED dictionary? You just removed the structure and added random linebreaks and quotation marks so that it cannot be reused as easily. CSV is there to have multiple cells in different lines and not to take the whole line and put it into a single cell, so why didn’t you just utilize this? For one thing, the software that I was working with could only read a csv. So basically yeah its just a txt converted to a csv. I take it that you want the word to be in a different column and the meaning in another. Well, I didn’t need that as I already explained in a previous comment. It is very useful, thanks! Thank you very much. I have been searching for it for ages. Thanks for sharing…it is much helpful. This is a poet’s dream. I couldn’t find anything like this until now. It’s been years. The find function is a journey. Thanks a lot. I was searching a thing like that. And it is great for me. THANK YOU! You just saved me several weeks of work! Exactly what I was looking for! Thank goodness I didn’t have to make it myself!